Have you ever wanted a gorgeous celebrity smile? Many people do, but the thought of serious dental surgery can be daunting. At Chandler Dental Arts in Chandler, Arizona, Mital Patel, DDS and the team of experts can help craft your perfect smile without lengthy surgical procedures, thanks to custom veneers. For more information on how veneers can upgrade your smile, call Chandler Dental Arts or book an appointment online today. Veneers are created out of a very thin layer of porcelain, which fits over your teeth to completely change the look of your smile. An irreversible treatment, veneers completely mold and bond to your natural teeth to create your desired look. A relatively quick and painless procedure, veneers are typically recommended for patients who want to transform their smiles without undergoing extensive surgery. Porcelain is the most common material used for veneers, but your dentist may also suggest Lumineers® or composite resin veneers, depending on your teeth. Once you decide on the type of veneers you want, Dr. Patel will likely suggest two separate appointments to set your custom veneers. First, he will clean your teeth and determine the correct shade for your veneers. 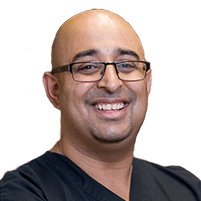 Next, Dr. Patel will remove a small portion of enamel from your affected teeth to make room for the veneers. An impression of your teeth is then made, so your veneers can be created in the lab. While you wait for your permanent veneers, Dr. Patel will fit you for temporary veneers. At your next appointment, the temporary veneers are removed and your teeth are expertly cleaned to prep for your permanent veneers. After the veneers are fitted to your teeth with an adhesive, Dr. Patel will make sure they perfectly fit every contour of your teeth and look as natural as possible. The veneers are then light cured for one minute and polished. How can I care for my veneers at home? Not only can porcelain veneers reshape your smile and correct the color of your teeth, but they also last for up to 20 years with proper care. Call Chandler Dental Arts or book an appointment online today to find out if you’re a good candidate for veneers.